Cambridge 50 miles north-east of London, is a thriving English City in the South-East of England, with 108,863 residents, according to the 2001 census. Of those residents, 22,153 are students in the 31 separate colleges that together make up the world famous University. It is a beautiful, thriving City, combining the old and the new. Parts of the University buildings date back to its formation in 1209, and the beautiful Kings College Chapel, built in the 1500's, viewed from across the River Cam, is architecturally and aesthetically stunning. Modern developments and shopping facilities, including a daily open-air market make up a City of great charm and character, with green pastures close to the City edge, the river running through the centre, and several parks, such as Midsummer Common, Parker's Piece and Jesus Green complementing the urban environment.The City, its local environment, the University and its booming high-tech Industry, known as 'Silicon Fen' attract in the region of 4.5 million visitors a year. Since the early 1980's, Cambridge City Council has had a Recycling Officer to help create and co-ordinate the Council's waste disposal and recycling initiatives. An early publication, 'No Time to Waste – Recycling Directory for Cambridge' from 1994, was distributed to City residents, as a handy guide to recycling facilities within the City and its community. This covered official Council facilities, such as Household Waste Recycling Centres (HWRC's) and weekly household kerbside collections, as well as lists of charity shops that would accept certain secondhand goods, resale shops, and places to buy recycled goods. Importantly, it emphasized the need for individuals and the community of residents within the City to be recycling and minimizing waste, with several pages of facts and figures of facts about waste. The publication, produced jointly with Cambridge Friends Of the Earth, was a valuable resource for City residents. The most recent figures on waste disposal for the City show that just over 46,000 tons of rubbish were produced in the City in 2005/06. Currently, Cambridge City Council operates its waste disposal and recycling facilities in partnership with 7 other local Councils, in the greater Cambridgeshire and Peterborough region. Under the name 'Recap' this partnership co-ordinates its services and acts to reduce its waste, through public initiatives, such as encouraging home composting schemes, and information services. In the year 2005/6, the total tonnage of rubbish produced in this total region was 380,000, with 152, 000 tons of that able to be recycled, approximately 40%. The facilities in Cambridge for recycling are very good and well-co-ordinated. There are around 350 recycling banks for paper and glass in the City (1 recycling bank for every 311 residents), and in the region there are 12 HWRC's, which can accept a range of items for recycling, including plastic bottles, white goods, car batteries, and oil. Kerbside collection within the City is efficient and operated well – as well as black wheelie bins for household rubbish, a green wheelie bin (which like the black bin, comes in 3 sizes, on request) for garden compostable waste is provided by the Council for most households. In addition to these, a black box, for dry recycleables, and a blue box, recently added to the system, for clean plastic, are provided and collected fortnightly. 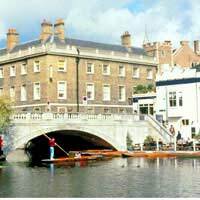 Cambridge has always been a creative, progressive, liberally-minded and environmentally-conscious City, partly due to its University status, and partly due to its unique position on the edge of the Fens, with easy access to London and East Anglia. The residents and visitors to the City, steered by the Council and its various schemes and initiatives, have always sought to maintain its 'green' image, and be a model of a City that truly 'reduces, reuses, and recycles'.